Finished Size: less than 1" x 1.75"
I did this project as a total lark, just to show my love for the character. Vegeta was the first Dragonball (DBZ) character that appealed to me, from the very first episodes that I saw (FYI: final bout of the Cell saga - Z fighters vs. Cell). 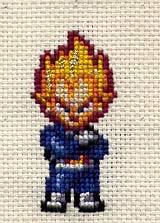 So, some 6 years later, after finding some really cute super-deformed pictures of a handful of powered-up DBZ characters, I decided to immortalize the fiery-tempered saiyan prince in needlepoint. Although I haven't stitched the rest, I've included patterns for five more SD DBZ characters, all derived from the same source. They all look like they did near the end of the Cell saga, just without the battle damage (heh). Oh, and I used a bit of gold metallic floss to jazz-up some of the highlights in the super saiyan's hair. Metallics are a real pain to work with, but I think the effect was worth it.